by week. (Saturday to Saturday) $650. Don't put your pet in the kennel, bring your pet along for an additional $50.00 per pet. Harah's Casino National Entertainment Theater as well as gambling. Great Smoky Mountains. Cherokee Unto These Hills Outdoor Theater and Village. Bryson City, Great Smoky Mountain Railroad. Maggie Valley Dinner Theaters, Ski Resort & Ghost Town in the Sky. Gatlenburg & Pigeon Forge only an hour away. 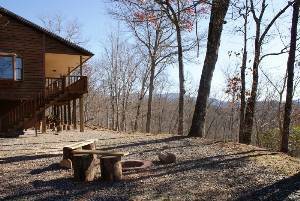 View of the valley can be seen from living room, master bedroom and covered porch. 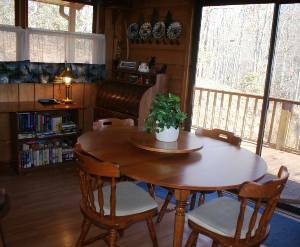 Queen Bed, Bay Window, Sliding Doors onto porch and overlooking valley. Privat bath. 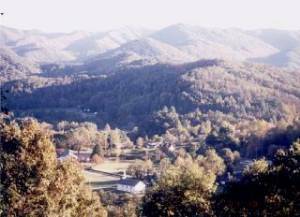 View of the valley complete with white steepled church can be seen from recliners. Dine inside or on the deck. View is great from either. You must provide your own marshmellows. 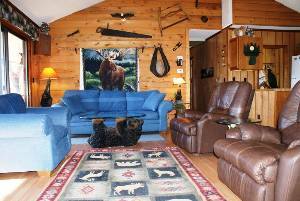 This is second time that we have had the opertunity to stay at this wonderful property. Whatl a wonderful time. The property was clean, well laid out, and looked after by local people close by willing to help you should the need arise. The last but not least fact is the location. What a view to wake up to, barbecue by, sit and eat breakfast lunch and dinner, I could go on. Home away from home. 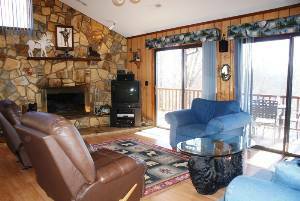 Treetops is truly a home away from home. 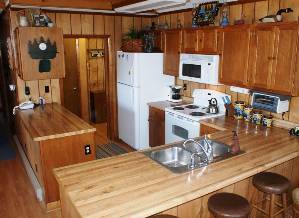 The cabin is well supplied with anything one could possibly need in a rental cabin. We did feel right at home. Treetops is secluded, yet offers a spectacular view. Our favorite sitting spot was the front porch swing, especially at night, when the rush of the river can be better heard. We surely plan to return to Treetops, hopefully often! Thank you very much for allowing us to stay in your wonderful vacation home. Rhonda and I realy enjoyed ourselves and managed to get the much needed break that we were looking or. 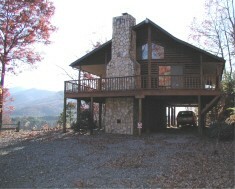 Having stayed in the Bryson City area 3 times befor by far your home out matched the other homes that we have stayed in. We are getting ready to leave after our week at Treetops. This week has been very relaxing and restful. Just what we needed. Everything was great. We look forward to returning to tTreetops in the future. 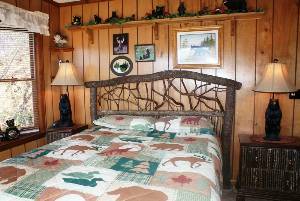 Out of season specials - Winter rates available upon request. More than 4 persons additionl charge. Deposit required. Deposit: $150 security and confirmation deposit. Cancellations and Refunds: $150 deposit not refunded if cancel after confirmation or damages incured. Other Fees: Consider Small Dogs - Pet Fee - There is an additional charge of $50.00 per pet.